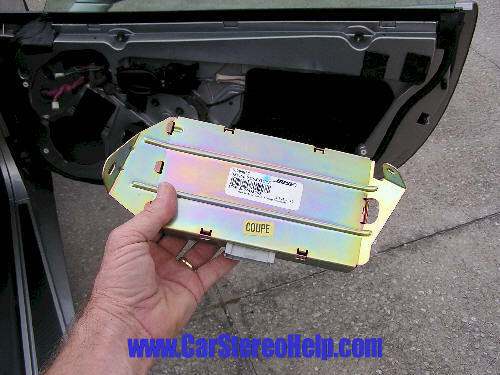 All BOSE amplifier repairs have a Lifetime warranty, car stereo one year. CD does not work, or will not accept CD at first, or will not eject CD, back lighting for display dim in spots or out, $225. Clock stuck at 1:00, see CDM (below). 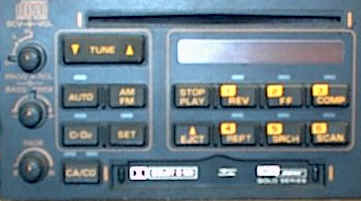 Repair - '90-92 Corvette, we also suggest sending CDM (Tuner Box), when sending these Corvette radios for repair. Repair - '93-96 Corvette, all stereo functions work, intermittent audio all speakers, power antenna up and down with audio in and out? See CDM below. 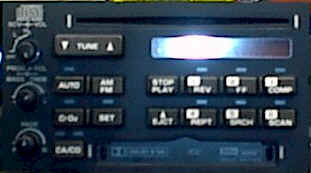 NO tuning to a specific FM radio station. 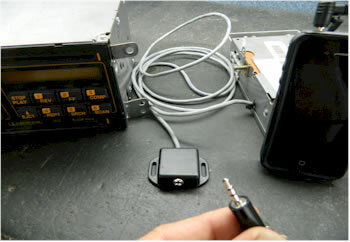 Device hooks directly to CDM (Tuner/Receiver) box. With CDM repair add iPod, $100, without repair $150. Ignition on, stereo off, push the "Set" button. Light should appear above set button. Push the "Tune down" button for hours and the "Tune up" button for minutes. Push the "Set" button to disengage or turn your stereo on. Bose speakers/amplifiers snap, crackle, pop, sizzle, have high pitch squeal, sound distorted, hum, low or no volume, repair of these amplifiers at speakers is $80 each with lifetime warranty. Older style Bose Amplifiers, mid '88 and older do not carry lifetime warranty, repair rate $100. BOSE AMPLIFIER NOTE - Okay, we have seen Bose amplifiers for Corvette for sale from some internet stores. In reality, they are Cadillac, Acura, Nissan or other Bose amplifiers. These amplifiers have a white label placed on them for your Corvette application with correct part number, front or rear. These other amplifiers are used, not repaired, they do not provide the correct crossover points, have different output levels, front and rear amplifiers are mixed. They are not for Corvette! Stereo unit powers up, no or distorted audio, no FM, display on "Control Head" stuck at 1:00, some/all speakers work intermittently, or the system is down. Repair rate for CDM box $125. (1) '93-96 CDM boxes encounter water damage. With time and age, the weather stripping around the rear hatch shrinks and allows water to enter into the rear pockets. (2) Rare occasions, display locked at 1:00, may be a control head problem, (more common in '93). 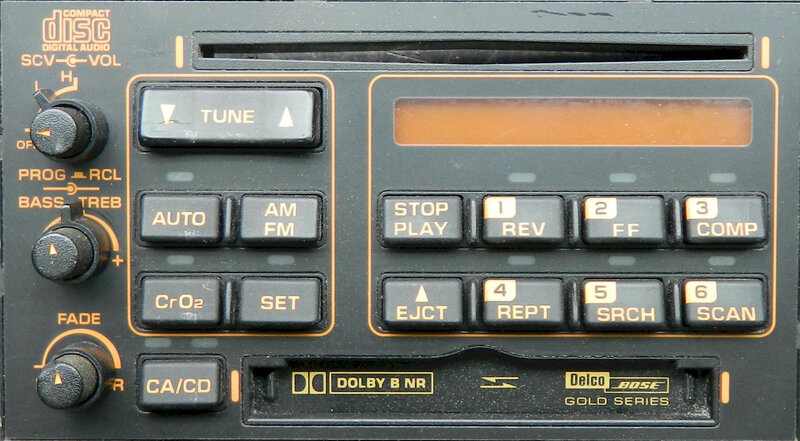 CDM boxes can be found under the dash board on the passenger side ('90-92) or in a rear pocket on the passenger side of the vehicle ('93-96). We have seen the units ('93-96) behind the seat submerged in water and have corrosion, also check connectors at the CDM box. When the head unit is turned on and off you should hear a click from the relay inside the CDM box. If you have snapping and popping from some of the speakers you will have to troubleshoot to the defective amplifiers separately. See How to Troubleshoot Your Corvette Bose System. We repair all Corvette radio problems. We have listed only the most common Corvette radio problems on this page. Ignition on, stereo off, push the set button. "Set" should appear in the top right corner of display. Push the "Scan" button for hours and the "Seek" button for minutes. Push the "Set" button to disengage or turn your stereo on. 1) AM 531-1602 with 9k steps, FM 87.5-104.0 with .05 steps. 2) AM 531-1602 with 9k steps, FM 76.0-90.0 with .1 steps. No tape, tape ejects, or tape auto reverses on it's own, display remains on with ignition OFF (this may drain the car battery), AM or FM intermittent or does not work, speakers cut in and out. Want to upgrade to CD? 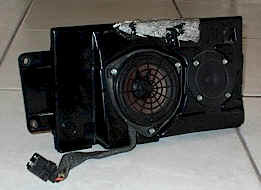 The '94-96 Chevrolet Camaro AM/FM/CD player physically fits the opening of the original stereo. However, there is a wire harness and antenna adaptor needed along with a small modification to the wire harness. Weak channel or channels, speakers snap, crackle, sound blown, distorted or do not work, (usually right front speaker first), does not eject tape. Missing sections of back lights on buttons, $85. CD player inop, will not accept and play CD's, $195. We no longer repair this Pioneer CD changer, unreliable after repair and does not stand up to our one year warranty.